Molecular Breast Imaging (MBI) is a new FDA cleared technology and is emerging as a critical tool in the fight against breast disease. Molecular breast imaging (MBI) finds three times as many cancers as conventional mammography in women with dense breasts, according to a new study published online in Radiology. This is welcome news, because while mammography continues to be the gold standard for breast cancer screening, its sensitivity has been shown to be reduced in this population. Advances in Molecular Breast Imaging, a new AuntMinnie.com special report on MBI, an exciting new technology in breast imaging. 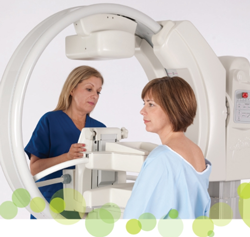 In conjunction with ProMedica, TRA offers the first and only dedicated Molecular Breast Imaging system in Ohio and Michigan, produced by GammaMedica, Inc.
*Study results presented to compare MBI to traditional mammography at the American Society of Clinical Oncology’s 2008 Breast Cancer Symposium in Washington, D.C. Consult your breast care specialists to discuss your risk for developing breast cancer and determine if you are an appropriate candidate for Molecular Breast Imaging.